But can you eat just 6? They found that people who eat between 5 and 10 grams of nuts each day have a lower risk for several diseases (heart disease, cancer, diabetes, respiratory, and neurodegenerative diseases such as Parkinson’s). The cohort was large (~120,000 people from the Netherlands) and older (people in their 50s, 60s, 70s). Although they found whole nuts and peanuts beneficial, peanut butter was not. They chalked this up to the additives in commercial peanut butter like salt and trans fats. I think it’s the processing. I’ve posted a couple studies so far that show our bodies handle ground nuts differently than whole nuts. 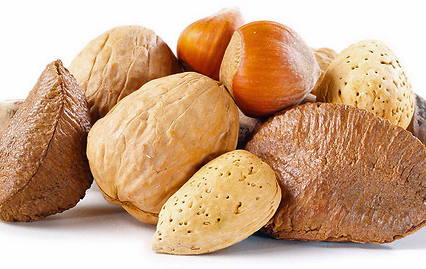 We derive considerably less fat and fewer calories from whole, raw nuts than from cooked or ground nuts. Benefit was seen for eating 5-10 grams, but it began to wane for higher amounts. That was especially true for diabetes, for which risk went back up in the 10+ category. 5-10 grams isn’t much, just 1/4 of an ounce, about 5 or 6 almonds. More than that wasn’t any better. If you eat almonds and peanuts and walnuts, that is, a combination, you have to keep the combined intake at ~7 grams/day. That right there is what makes running with this study risky. Nuts are a trigger food for some people, they can’t eat just a couple. Nut consumers were on average somewhat younger (Table 1), leaner (in women), drank more alcohol, ate more vegetables and fruits, were less often hypertensive or never smokers (women), but were higher educated and more often used supplements, or postmenopausal hormone replacement therapy (HRT). Women with the highest nut consumption less often reported diabetes. There are a lot of good health behaviors here, any of which could be influencing the lower death rates. They did account for much of this though. Another consideration … 10 years is a long time to go without reassessing someone’s diet. Still, I think eating some nuts is better than eating no nuts. This entry was posted in Uncategorized on June 12, 2015 by Bix. Yum, love nuts, even peanut butter. But I buy inexpensive, unsalted, organic p-nut butter at TJ’s, and the only ingredient is organic nuts, so I’m hoping that’s ok.